I'm reading ... Kafka on the Shore by Haruki Murakami, as well as The Tenant of Wildfell Hall, as well as And Another Thing (the Hitchhiker's Guide to the Galaxy sequel by the author of the Artemis Fowl series), as well as about 6 non-fiction books. I'm a bit obsessed by reading at the moment. I'm working on ... a rug that I started twenty years ago. I wish I was exaggerating that, but I'm not! It's made from yucky acrylic, because I didn't know any better back then, and it's oh-so-70s, but I'm finishing it anyway. Yesterday I counted the sections and was delighted to discover that I've finished 3 more than I thought I had. Not long to go now! I'm drinking ... endless cups of tea and eating chicken soup. I've still been sick on and off, so the simple comforts of flavoured liquids are my favourites right now. The picture ... My rug doesn't look like this. 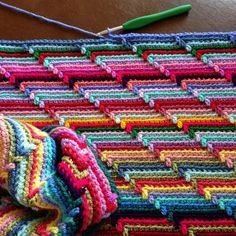 I'd love to do something like this, but I don't have the patience for all that weaving in! Urgh!